I love the Ave Maria one - so, so beautiful! They're all beautiful, but I agree with Jen: Ave Maria and St. Therese! i like the one that says mothers must leave the altar of God and find Him in their housework. How beautiful!! I like the one "Love is the main ingredient." The Ave Maria apron is beautiful! I agree with Sara above. "Do Small Things with Great Love" makes a great reminder when we are in a pickle to get dinner ready for our little peeps. I think I would break my budget this month if I bought 2 aprons I really love... now off to hope I find more change in the laundry. lol! just kidding. Thank you for sharing and posting! The St Therese one... but the celtic cross one is pretty close. Mine has to be St. Therese. She's my girl! And I'm working on preparing snacks for tonight's RCIA. The Little Flower is our featured Saint today. Thanks for a wonderful giveaway! I like the khaki Ad Majorem Dei Gloriam. "A married woman must often leave God at the altar to find Him in her housework." I really love the Black apron embroidered with St. Benedict Medal design and motto: Ora et Labora (Work and Pray). As a leader for a Little Flowers Girls Club, I am partial to the St. Therese one! Beautiful! I love them all but I especially like red "Bless this Kitchen" apron :) The St. Therese apron would be perfec fro when I am baking for our brand new Little Flowers club! Love the St.Therese and blue Catholic Cuisine ones! Hard to choose, but if forced to choose a favorite among these, I'd say "Do small things with great love"
I like the one that says,"Do small things with great love!" So true for mothers. Thank you for this chance to win one of your beautiful aprons. I second the "Do small things with great love!" 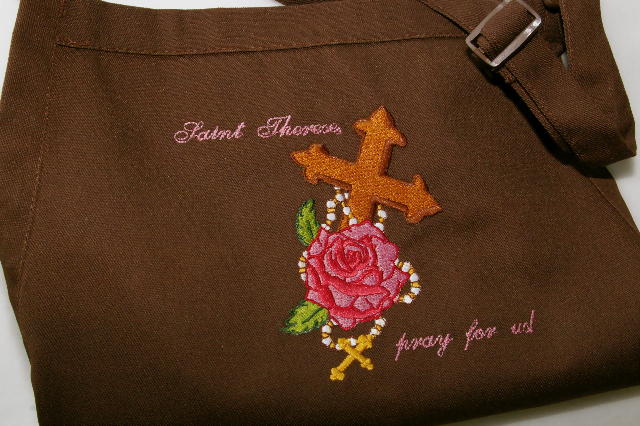 The St. Therese apron is lovely, too. How fun! I love the Ave Maria one, and the Saint Therese, but all of them are beautiful!!! My favorites are "Bless This Kitchen" in red and the big picture- one in blue, "Catholic Cuisine"
Along with the St. Therese apron, I love the one that says: "I find heaven in the midst of saucepans and brooms." I love the St. Therese apron. My birthday is close to her feast day, so I have always had an affinity for her. They are all beautiful! They are all so beautiful and inspiring. My new favorite is St Therese. So neat! Thanks for the giveaway :D Royal Blue apron embroidered with IHS design and "Do small things with great love! These aprons are all so pretty! I like the Ave Maria and the "Do Small Things with Great Love". I just may purchase both after the winner is announced. I hope I'm allowed to participate even though I live in Denmark and I am a Lutheran. I love Catholic Cuisine and find it really inspirational. My favorite apron is "The main ingredient". all the aprons are lovely but i'm loving the new St. Therese apron. it be perfect for me at my little flowers meetings--a craft apron. I absolutely love the Ave Maria one. The one with the dove would match my kitchen too. I love all of them, but my two favorites are "Do Small Things with Great Love" and the St. Therese apron. These would make wonderful gifts!! I love the one with the Benedictine medal on it! My husband and I went to Benedictine College that is where we met. We have a devotion to him and have both read the Benedictine Rule. I love the "Main Ingredient" is Love ~ The Sacred Heart! Our last name means 'heart' and our family is dedicated to the Sacred heart. I love the "Love is the main ingredient" and the "Bless this kitchen". What a lovely give away! I love the St. Therese apron. Although the Ave Maria one is a very close second! I like St Therese and Ora et Labora. Probably since my oldest just studied that phrase with me on Latin. The aprons are all beautifully made. What a "fitting" giveaway for today! I like the navy one with the crown and the quote that starts "a married woman....." so true! Nice giveaway too! I love the Catholic Cuisine - Ave Maria apron. My resolution for this school year was to focus on Home Ec, especially meal planning, so this would be a lovely reminder of why I am home with my children. Love the new Therese brown apron and the chi-rho. They are beautiful designs! They are all so beautiful and appropriate for the Catholic mother in the kitchen. I love the ones in particular that remind us of the beauty often forgotten in the menial, small things of our vocation!....such as "Do small things with great love" and the one quoting St. Frances of Rome. The Royal Blue apron embroidered with IHS design and "Do small things with great love!" is just precious. I like that one very much...and the reminder is one I could use often. I really do love the St. Therese one best, because she is my patroness and the design is just beautiful! I love the holy reminder. I love the St. Therese apron - our family has a special devotion to her. I also love the Dominican Cross one. We attend a parish run by the Dominicans and their order has become very dear to us because of their example and preaching. I'd have to choose Bless this Kitchen. My cooking needs all sorts of help :). Thanks for the chance! I love them all.. But my favorite is "Do small things with great love" followed by the Therese apron.... followed by the Celtic one. I love the St. Therese one because she is my confirmation saint and my inspiration. I also loved the parenting one a lot. Thanks for hosting this fun giveaway! Oh, St. Benedict-Ora et Labora is my favorite! Thanks for the opportunity. I love the Catholic Cuisine one followed by the St. Benedict one. They are all good! Each one is lovely. One nicer than the next. It is a toss-up, well I guess the St. Therese pray for us is my favorite. 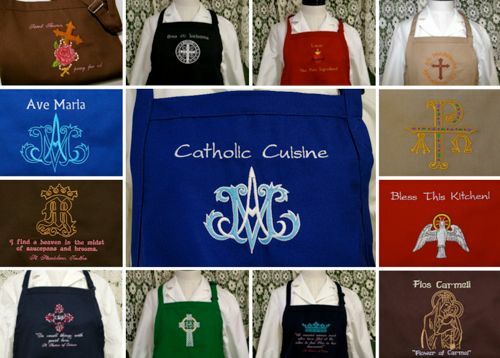 My two favorites are the Catholic Cuisine and Ora et Labora aprons. Out of those two I am hard pressed to choose which I like better. I love the Small Things with Great Love apron. And the Bless this Kitchen apron. SO cool. I love the Ave Maria and the one with the crown- my husband loves it when I wear an apron and the crown apron reminds me why! My favorite is the St. Benedict apron. I even named my new son Benedictus! The new St. Therese one is absolutely gorgeous too! Oh, I like all of them! I love the blue Ave Maria one, and also the red sacred heart one and the St. Therese. I think I'd pick the Ave Maria one if I won, per chance. How fun! They are all beautiful, but my favorite, if I had to pick one, is the blue "Ave Maria". They are all lovely! I love the Ave Maria and St Therese. I love the Benedictine Medal Embroidered Apron. My 2nd favorite is the Ave Maria!! Blue is the color of many of my dishes, etc. Thank you! My favorite used to be the Navy one with " A married woman....", but now I think I am leaning towards the New Saint Therese one. I love these aprons. I think my wife will be getting one for Christmas this year, I just need to decide what one. The Ave Maria and IHS "Do Small Things with Great Love" aprons are my favorites, but they are all beautiful. poracI love the apron that says Love is the main ingredient. I've ordered from her before and her work is beautiful! I think the Ava Maria and St. Therese designs are beautiful but I like the St. Stanislaus' quote: "I find a heaven in the midst of saucepans and brooms" the best! Thank you for sharing. I was so surprised to see the apron with the quote from St. Frances of Rome! That is my favorite quote and I have it printed and taped to my kitchen cabinets! I may have to leave some hints since my birthday is coming up soon...Thanks for all you do! I love the St. Stanislaus quote; they are all great! Wearing one of these beautiful aprons is a way of sharing your faith without saying a word! They'rea ll so pretty- it's really tough to choose just one as a favorite. Mine are St. Therese and the Jeweled Chi Ro. My favorite is the one that says do small things with great love. I love the one with the St. Stanislaus quote! Thanks for the giveaway! I like the "Main Ingredient" red apron. God bless you! I love the Khaki Apron that says " Ad Majorem Dei Glorian" and also the St. Benedict Medal design. It's a tie for me between St. Therese and St. Benedict! My youngest is here because of my devotion to St. Therese and I feel like the only way I can get my prayers in some days is by working (ie. cleaning) and praying! I love them all and so it was a difficult choice. My favorite is the blue one with IHS symbol that says "Do small things with great love". They are all so pretty and fitting for a mother and homemaker like myself. I love the one that reminds me to "Do small things with great love"...an important reminder for a home educating mother! I love all of them, but I think my favorite is the "do small things with great love." I really like the "Love, the Main Ingredient" one with the image of the Sacred Hart of Jesus! Tough to choose a favorite; so for today, I am drawn to the Celtic Cross, Catholic Cuisine, and The Main Ingredient. Really, they are all so nice! My favorite is the new St. Therese apron. But I love them all...just beautiful! Thank you for the chance to win one! Since I'm always preparing for my little "Brooms" St Stansislaus is my favorite. Love the Ave Maria one and the one with the quote about finding God in your housework! And I love any apron with pockets - so useful!! I love the blues of the Ave Maria apron, but my favorite is the beautiful St. Therese one. I think the rose makes it for me. :) Plus, she's a patron saint of my youngest! I'm thinking of buying one to support the missions in Africa: great idea! The apron embroidered with IHS design and "Do small things with great love!" is my favorite. Thank you for this opportunity! Hard to choose! They're all so beautiful, but I think the "Love, the main ingredient" is my favorite. These are all amazing! My poor aprons are very sad in comparison. Thank you! My mothers middle name is Terese, my middle name is Therese and I named my eldest daughter Lisa Therese, so of course my favourite is the St. Therese apron, I love it. I've always loved this quote: "A married woman must often leave God at the altar to find Him in her housework." And the IHS "Do small things with great love" is a wonderful reminder too, of our vocations. Hard to decide - but I love the Sacred Heart one! My favorites are "Love, the Main Ingredient" and "finding God in the housework." Of course, they're ALL beautiful! :-) Thanks! GORGEOUS designs! My fave is Bless this Kitchen!!!!!!!!!!!!!!!!!!!!!!!!!!! I like the royal blue Ave Maria Catholic Cuisine apron the best. All of your aprons are just lovely! If I had to pick my eyes were immediately drawn to the Celtic Cross and Ave Maria aprons. I like the St. Therese apron! They are all beautiful. I like the Sacred Heart and St. Benedict, but they are all so lovely! I really like the one that says "Do Small things with Great Love". it reminds me of the lovely Danielle Rose song. Since I have a son and daugther who each belong to a Benedictine order I would choose the St Benedict. But St Theresa will always be first in my heart! If I can only choose one favorite , then it has to be the Catholic Cuisine with the Marian symbol in blue. They are all lovely! My favorite is the "A married woman must often leave God at the altar to find Him in her housework" one. Lovely! My favorite is "Do small things with great love". Sometimes the only thing you can do, but it's also the most important. How to choose??? :) I like the AMDG one... and the rose on the St. Therese one is pretty meaningful to me. Thank-you, God bless!! prudenceisavirtue at hotmail dot com. I like the Ora et Labora one. Hard to choose, they're all so great, but I think I would go with the Royal Chi-Rho as my first choice. I love the new St Terese apron! I also really like the brown to remind you of the colors of the order. Thanks for the give away! I am sure any one of us entering will appreciate and enjoy the apron. Love is the main ingredient is my favorite, but they are all great! What cool aprons! I like the one third down on the far left, but I cannot read it well. So beautiful, what a decision. My first choice would be the Khaki; Ad Majorem Dei Glorian. I think they are all lovely. But I really liked 2 aprons alot, St Therese and the IHS "Do small things with great love." Thanks for the chance to win. God Bless. I love the "Ad Majorem Dei Glorian" apron. After all, isn't that why we do what we do? My favorites are the Sacred Heart, "Love, the Main ingredient" and the new St. Stanislaus one. They are so beautiful. how could I choose just one. I do love "St. Therese, Pray for Us," and "AMDG," but I think my favorite might me "Love, the main ingredient" with the beautiful Sacret heart of Jesus! thanks for this lovely giveaway! I would love to give the St. Therese apron as a gift to a friend whose birthday is coming up! Note: I am with child and due any day, so if I do not respond right away (if I actually win! ), please give me a few days! I LOVE the St. Therese apron. I would love to win it and give it to my MIL or my daughter...they are both named Theresa! I really like all of the products on Catholic Embroidery and these aprons are beautiful!! Being a Third Order Carmelite, I especially like the St. Therese apron and the "Our Lady of Mount Carmel" apron. What a wonderful way to live our faith as we cook for our beautiful families... truly a gift from God. I love the Ave Maria apron! They are all very beautiful. I really like the 'leave the altar' one and 'Do small Things...' I would love any of them. Thanks! My favorite would have to be the St. Stanislaus one with the quote about heaven being among the saucepans and dishes in the kitchen. So.... me! My fave is the St. Benedict one! I love them all, but I think my fave is the Flower of Carmel apron! Oooh...I absolutely LOVE the Brown apron embroidered with the quote: "I find a heaven in the midst of saucepans and brooms"!! oh my goodness, that is a really difficult question. there are about four or five that i really like. but i think my favorite is the Ave Maria one. I'm new to the website, but love all of the resources you have to offer! Great ideas for our Catholic homeschooling family! I LOVE all of your aprons, but especially the "Do Small Things with Great Love." I love them all! How to choose? Beautiful Aprons!! Beautiful Reminders of God love for each one of us!! I love the St. Stanislaus apron. St. Therese is my patron saint, so I would love that one, too. Oh, either "Small Things with Great Love" or St. Stanislaus! They are all lovely but I really like the "Do small things with Great Love" A nice reminder! I love the Ave Maria apron! All of them are so lovely!! My favorite: I Find Heaven a Amidst the Saucepans and the Brooms. I love the Sacred Heart one. They are all very lovely. Please enter me. Mary L.
1) Royal Blue apron embroidered with IHS design and "Do small things with great love!" 2) St. Therese of the Little Flower's apron. I think there should be a blending of both. Yes, St. Therese can "pray for us", but I think the tiniest reminder of small things with love is more like the little Way. I love both the St. Therese one and the Ava Maria - it's hard to pick just one!! Oh, how lovely! Please enter me for the giveaway...I love St. Therese! My favorite is the one with the St. Stanislaus' quote! Love the aprons. I had not had a chance to view them before today! I like the quote from St. Frances. I try to find God in my housework everyday! The Our Lady of Mt. Carmel is my favorite. The rich brown apron looks great with the light brown thread of Mary holding Jesus. The apronis beautiful, yet simple. Love the Celtic cross one and the ave Maria!